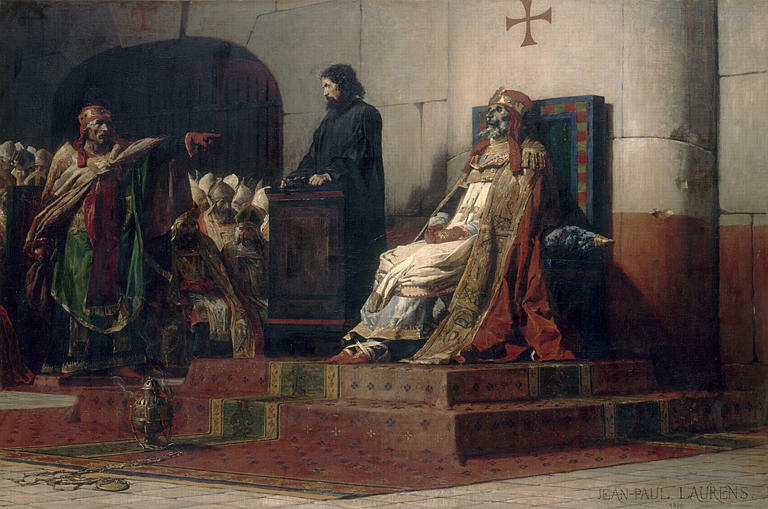 Painting: "Le pape Formose et Etienne VII" ("The pope Formosus and Stephen VII"), by Jean-Paul Laurens, 1870, oil on canvas, 100 cm X 152 cm, housed in the "Musée des Beaux-Arts de Nantes", France, inv. 1052. Via "Le ministère de la culture et de la communication" of France, available at http://www.culture.gouv.fr. Photograph credit Gérard Blot/Agence photographique de la Réunion des Musées Nationaux. Photograph Copyright © "Agence photographique de la Réunion des Musées Nationaux". This image file is hosted in computer servers of "Le ministère de la culture et de la communication" of France, http://www.culture.gouv.fr. Special thanks to Katia Cordova from the "Agence photographique de la Réunion des musées nationaux et du Grand Palais des Champs-Elysées", Paris, France, http://www.photo.rmn.fr, and to Robbi Siegel from Art Resource, Inc., New York, U.S.A., http://www.artres.com, for this photo courtesy. "Eight hundred years exact before the year"
"I was made Pope, men made Formosus [' 'Formosus': Pope (891-895).'] Pope,"
"Say Sigebert [' 'Sigebert': Sigebert II, king of Austrasia, afterwards a monk. He is set down as a saint in the Romish Calendar.'] and other chroniclers." "Ere I confirm or quash the Trial here"
"Of Guido Franceschini and his friends,"
"Read, - How there was a ghastly Trial once [' 'How there was a ghastly Trial once': this and the accounts following of the successive decisions of the popes is given substantially as Browning gives it in Platina's 'Lives of the Popes', Dr. Benham's edition.']" "Of a dead man by a live man, and both, Popes:"
"Thus - in the antique penman's very phrase." " 'Then Stephen, [' 'Stephen': Pope (896-897).'] Pope and seventh of the name,' "
" 'Cried out, in synod as he sat in state,' "
" 'While choler quivered on his brow and beard,' "
" ' 'Come into court, Formosus, thou lost wretch,' ' "
" ' 'That claimedst to be late Pope as even I!' ' "
" 'And at the word the great door of the church' "
" 'Flew wide, and in they brought Formosus' self,' "
" 'The body of him, dead, even as embalmed' "
" 'And buried duly in the Vatican' "
" 'Eight months before, exhumed thus for the nonce.' "
" 'They set it, that dead body of a Pope,' "
" 'Clothed in pontific vesture now again,' "
" 'Upright on Peter's chair as if alive.' "
" 'And Stephen, springing up, cried furiously' "
" ' 'Bishop of Porto, wherefore didst presume' ' "
" ' 'To leave that see and take this Roman see,' ' "
" ' 'Exchange the lesser for the greater see,' ' "
" ' ' - A thing against the canons of the Church?' ' "
" 'Then one - (a Deacon who, observing forms,' "
" 'Was placed by Stephen to repel the charge,' "
" 'Be advocate and mouthpiece of the corpse) - ' "
" 'Spoke as he dared, set stammeringly forth' "
" 'With white lips and dry tongue, - as but a youth,' "
" 'For frightful was the corpse-face to behold, - ' "
" 'How nowise lacked there precedent for this.' "
" 'But when, for his last precedent of all,' "
" 'Emboldened by the Spirit, out he blurts' "
" ' 'And, Holy Father, didst not thou thyself' ' "
" ' 'Vacate the lesser for the greater see,' ' "
" ' 'Half a year since change Arago for Rome?' ' "
" ' ' - Ye have the sin's defense now, Synod mine!' ' "
" ' Shrieks Stephen in a beastly froth of rage:' "
" ' 'Judge now betwixt him dead and me alive!' ' "
" ' 'Hath he intruded, or do I pretend?' ' "
" ' 'Judge, judge!' - breaks wavelike one whole foam of wrath.' "
" 'Whereupon they, being friends and followers,' "
" 'Said 'Ay, thou art Christ's Vicar, and not he!' ' "
" ' 'Away with what is frightful to behold!' ' "
" ' 'This act was uncanonic and a fault.' ' "
" 'Then, swallowed up in rage, Stephen exclaimed' "
" ' 'So, guilty! So, remains I punish guilt!' ' "
" ' 'He is unpoped, and all he did I damn:' ' "
" ' 'The Bishop, that ordained him, I degrade:' ' "
" ' 'Depose to laics those he raised to priests:' ' "
" ' 'What they have wrought is mischief nor shall stand,' ' "
" ' 'It is confusion, let it vex no more!' ' "
" ' 'Since I revoke, annul and abrogate' ' "
" ' 'All his decrees in all kinds: they are void!' ' "
" ' 'In token whereof and warning to the world,' ' "
" ' 'Strip me yon miscreant of those robes usurped,' ' "
" ' 'And clothe him with vile serge befitting such!' ' "
" ' 'Then hale the carrion to the market-place:' ' "
" ' 'Let the town-hangman chop from his right hand' ' "
" ' 'Those same three fingers which he blessed withal; ' ' "
" ' 'Next cut the head off once was crowned forsooth:' ' "
" ' 'And last go fling them, fingers, head and trunk,' ' "
" ' 'To Tiber that my Christian fish may sup!' ' "
" ' - Either because of [capital iota][capital chi][capital theta][capital upsilon][capital sigma] which means Fish [' '[capital iota][capital chi][capital theta][capital upsilon][capital sigma] which means Fish': the letters of this Greek word form the initials of the Greek words for Jesus Christ, of God, Son, Saviour ([original Greek phrase in Greek characters, transliterated:] 'Iesoûs Christós Theoû Uiós Sotér'). The fish was used by the early Christians as a secret symbol by which they could recognize each other.']' "
" 'And very aptly symbolizes Christ,' "
" 'Or else because the Pope is Fisherman [' 'Pope is Fisherman': because he is the successor of Peter, the fisherman, whom Christ said he would make a fisher of men (Mark i, 17). '],' "
" 'And seals with Fisher's-signet.' "
" 'So said, so done: himself, to see it done,' "
" 'Followed the corpse they trailed from street to street' "
" 'Till into Tiber wave they threw the thing.' "
" 'The people, crowded on the banks to see,' "
" 'Were loud or mute, wept or laughed, cursed or jeered,' "
" 'According as the deed addressed their sense;' "
" 'A scandal verily: and out spake a Jew' "
" ' 'Wot ye your Christ had vexed our Herod thus?' ' "
" 'Now when, Formosus being dead a year,' "
" 'His judge Pope Stephen tasted death in turn,' "
" 'Made captive by the mob and strangled straight,' "
" 'Romanus [' 'Romanus': became Pope in September, 897, and held the see for three month and twenty-two days.'] his successor for a month,' "
" 'Did make protest Formosus was with God,' "
" 'Holy, just, true in thought and word and deed.' "
" 'Next Theodore [' 'Theodore': Pope in 898, held the office twenty days. '], who reigned but twenty days,' "
" 'Therein convoked a synod, whose decree' "
" 'Did reinstate, repope the late unpoped,' "
" 'And do away with Stephen as accursed.' "
" 'So that when presently certain fisher-folk' "
" '(As if the queasy river could not hold' "
" 'Its swallowed Jonas, but discharged the meal)' "
" 'Produced the timely product of their nets,' "
" 'The mutilated man, Formosus, - saved' "
" 'From putrefaction by the embalmer's spice,' "
" 'Or, as some said, by sanctity of flesh, - ' "
" ' 'Why, lay the body again,' bade Theodore,' "
" ' 'Among its predecessors, in the church' "
" ' 'And burial-place of Peter!' which was done.' "
" ' 'And,' added Luitprand [' 'Luitprand': a chronicler of the tenth century, and Bishop of Cremona. Died about 970.'] , 'many of repute,' ' "
" ' 'Pious and still alive, avouch to me' ' "
" ' 'That, as they bore the body up the aisle,' ' "
" ' 'The saints in imaged row bowed each his head' ' "
" ' 'For welcome to a brother-saint come back.' ' "
" 'As for Romanus and this Theodore,' "
" 'These two Popes, through the brief reign granted each,' "
" 'Could but initiate what John [' 'John': (IX.) became Pope in 898. He removed to Ravenna on account of disturbances in Rome.'] came to close' "
" 'And give the final stamp to: he it was' "
" 'Ninth of the name, (I follow the best guides)' "
" 'Who, - in full synod at Ravenna held' "
" 'With Bishops seventy-four, and present too' "
" 'Eude [' 'Eude': elected King of France in 888.'] King of France with his Archbishopry, - ' "
" 'Did condemn Stephen, anathematize' "
" 'The disinterment, and make all blots blank,' "
" ' 'For,' argueth here Auxilius [' 'Auxilius': a French theologian who lived about 900 and wrote some treatises against Pope Sergius III.'] in a place' "
" ' 'De Ordinationibus' [' 'De Ordinationibus': concerning ordinations. '], 'precedents' ' "
" ' 'Had been, no lack, before Formosus long,' ' "
" ' 'Of Bishops so transferred from see to see,' ' "
" ' 'Marinus [' 'Marinus': there was an ecclesiastic of this name in the fourth century. '], for example:' read the tract.' "
" 'But, after John, came Sergius [' 'Sergius': (III.) Pope, from 904-911. '], reaffirmed' "
" 'The right of Stephen, cursed Formosus, nay' "
" 'Cast out, some say, his corpse a second time.' "
" 'And here, - because the matter went to ground,' "
" 'Fretted by new griefs, other cares of the age, - ' "
" 'Here is the last pronouncing of the Church,' "
" 'Her sentence that subsists unto this day.' "
" 'Yet constantly opinion hath prevailed' "
" 'I' the Church, Formosus was a holy man.' "
- Robert Browning, "The ring and the book", from the author's revised text, edited with biographical and critical notes and introduction by Charlotte Porter and Helen A. Clarke, editors of "Poet-lore", Thomas Y. Crowell & Company, New York and Boston, 1897, chapter 10, "The Pope", pages 360-363, lines 24-149.